Download the patch used in this recipe. Using the deviate message is fast becoming "the sound of MC". In this recipe, we use deviate to generate two different audio functions: deviation of the playback rate of the instances of an mc.groove~ object, and automated pan movement of each voice. The mc.mixdown~ object offers signal-based panning location based on the pancontrolmode in use. You can learn more about mc.mixdown~ options, including this attribute, in the Mixing and Panning in MC documentation guide. 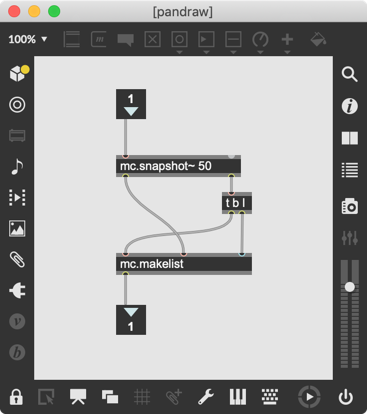 mc.groove~ : an MC-wrapped version of the groove~ object for looped playback. 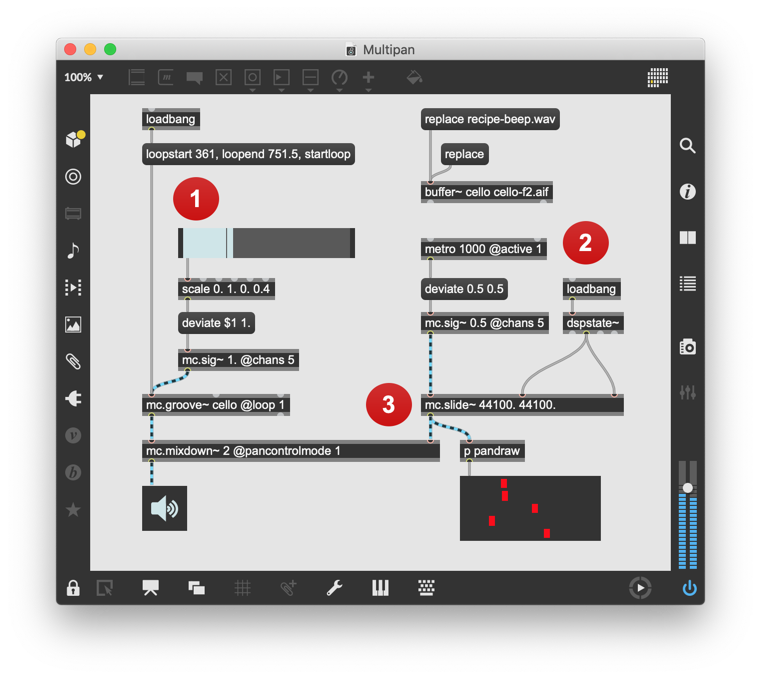 mc.mixdown~ : an object that mixes MC input to multiple output channels based on MC location signals. The deviate message can be used to generate different values for the playback rate of the each voice in an mc.groove~ object. This produces a cloud of sound from the simplest of sounds. Each time that mc.sig~ receives the deviate message, a new set of values will be created. By banging the deviate message with a metro, we get a new set of pan values every second. Using mc.slide~ with up- and down-values equal to the sample rate, it will take one second to move from the current values to a new set of values. This matches the one second interval of the metro object. We send the values to mc.mixdown~ using pancontrolmode 1, which places the stereo outputs at values of 0.0 and 1.0. This allows us to easily visualize the pan values using a multislider.